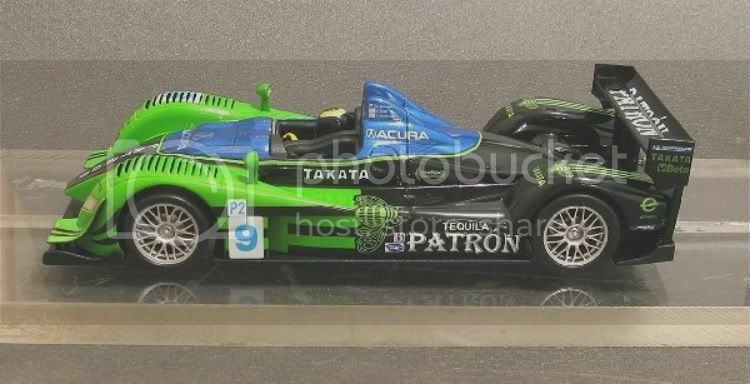 So what is this Acura ? Not really sure myself but it is obviously a make of LMP car for a start! I can only guess that it is a branch of or affiliated to Honda as it shares a lot of Technology. Honda developed chassis’s from Courage and Lola and labelled them as ‘Acura’, after their North American Luxury car operations. The engine is an ex IRL V8 block developed by Honda Performance Developments (HPD). 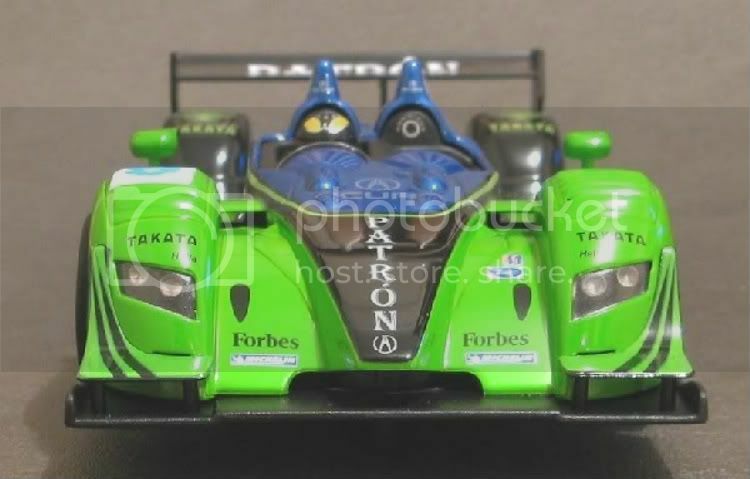 The cars themselves race the LMP 2 class of the ALMS Series by which varies from LMP1 inasmuch that it has an eight cylinder engine limit and either a 3.4 litre naturally aspirated or a 2.0 litre turbo or supercharged engine restriction. With the exception of overall minimum weight, all else is almost the same. The series was founded by Don Panoz of Panoz car fame way back in 1999 as a bit of a stocking filler to what is a vast arena of motor sport. Specifically set up with Le Mans style regulations and in conjunction with L’Automobile Club de L’Ouest, it has encouraged and empowered North American race organisations and teams to crack the European strangle hold on the Le Mans 24 hour race with more and more North American entries proving successful year on year. Something which has been in decline since the heady days of the sixties. Teams which race ALMS gain automatic entry into Le Mans although not all take up the offer. The results table of the ALMS series since its inception is totally dominated by US Teams but the make up of team members is very cosmopolitan. But by way of a change, this review will focus on the model depicted. 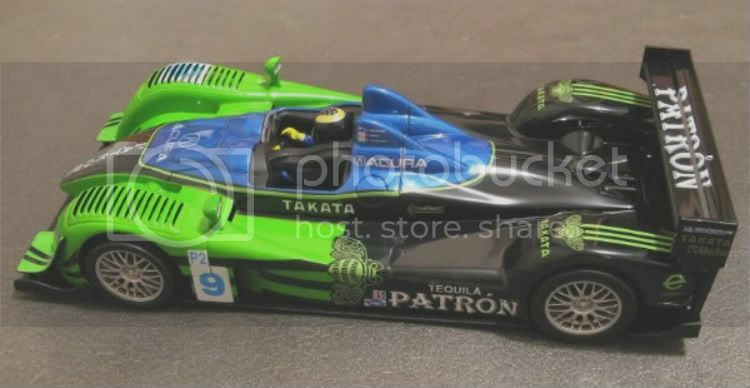 This is the Acura ARX 01b as raced by the Patron Tequila Racing team. The organisation has a broad interest in motorsport and also run cars in Indy, IMSA GT3 and even an NHRA Drag car. The American Lemans Series is a series of races run every month across North America with events running from two to ten hours . The long races being known as ‘Petite Le Mans’ events. The Patron (pronounced patrone) ALMS Team consists of American Scott Sharp, Australian David Brabham and Swede Stefan Johansson. So what’s the model like? 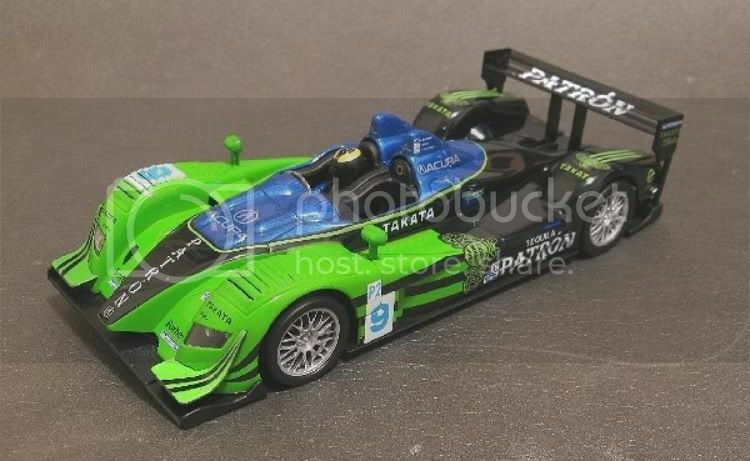 Well, attracted by the livery which extols it green credentials, I was looking for a successor to the aging Ninco BMW LMP with which I currently contest non magnet events. Being Ninco was fifty percent of the requirement and being a ‘potential’ was the rest. I purchased the model from Scalex World Adelaide and as always it was on my doorstep at the end of the week. And, once again, observing Wixwacing ‘new toy’ protocol, I poured myself a long shiraz and sat myself down with appropriate parcel opening accoutrements! On removal from the wrapping it showed itself to be a big model, along the lines of the Porsche and Audi LMP1s. With a wheelbase of almost 93 millimetres it was probably the longest wheelbase to date in my collection and on a par with the Revell Galaxy!!! The body construction and detail are good and the paintwork is the best I have seen on a Ninco model for some time. The green is bold and the rear half of the model is black with green tampo. Tampo is VERY crisp and a million miles from their BMW M3 offering. Another one of the models where all the drivers names are quite readable, with the aid of magnification lenses! There aren’t a lot of add on body parts but what there are, are going to be a bit vulnerable. The rear wing is a big screen production and only being fixed at the centre pylons is going to be a problem. There is too much leverage on these pylons should the loose end of the wing be hit or knocked for any reason. The rear view mirrors are almost inside the roll over zone and hopefully will have a reasonable life expectancy but, alas, the front of the model has two aerofoils, one either side, under the headlights. These don’t protrude beyond the chassis base but not being fixed to it causes them to be a statistic just waiting. The driver is well modelled and colours on him and his helmet are well finished. Dash detail is basic and the obligatory passenger seat carries the fire extinguisher. At the rear, a couple of parts at the rear of the wheel arches finish the rear end but again, especially in magnet racing, they look doomed to failure sooner rather than later. I may well just strengthen mine with some well placed epoxy resin. For all its detail and louvred front wings it’s interesting to note that a couple of vents on the front were modelled in tampo rather than given a 3D hole? The chassis is simplicity itself. I can’t see anyone making something as simple?? 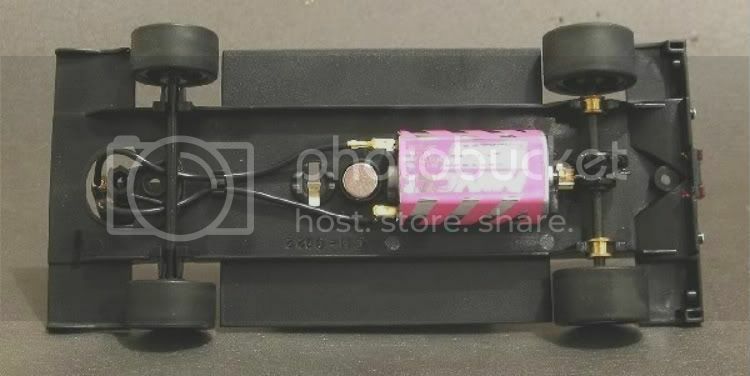 The irony is that I have driven some Plafit models with their over the top chassis and equal motors and they aren’t as good as this simple, simple chassis. What do we get. A simple but effective guide, a simple but effective front axle setup, a simple but effective rear axle set up and a simple but effective in line motor! and guess what!!! The motor ISN’T loose!! I kid you not, this has to be the first Ninco model of mine in living memory that wasn’t loose!! 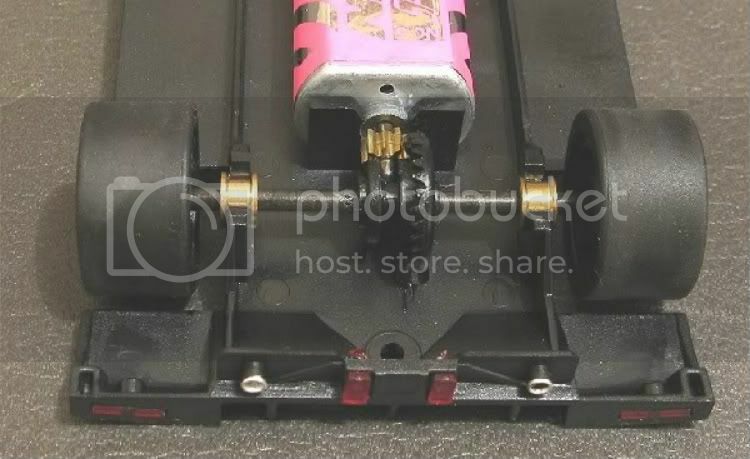 As a business tool the chassis is fine for magnet racing on Ninco track. Scaley and Carrera track will need to see some mods for the reduced grip available and the centre mounted traction magnet. 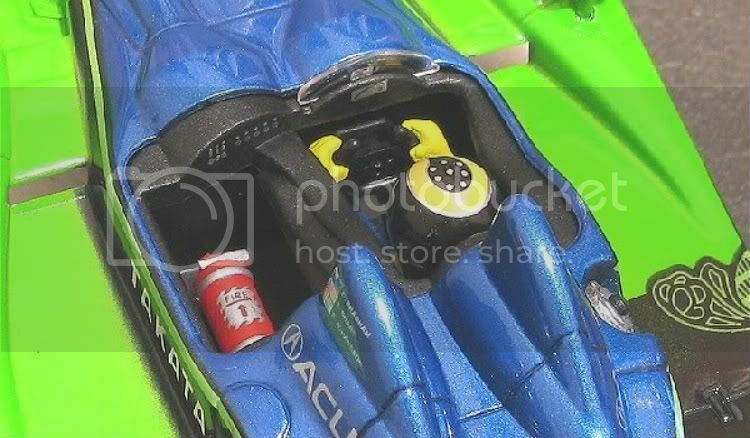 On checking the model over out of the box I noticed the traction magnet was up in its holder a bit. Suspecting a shim or something else in place I removed the magnet when the body was off. There was no shim and it was a simple case of pushing the magnet right home. 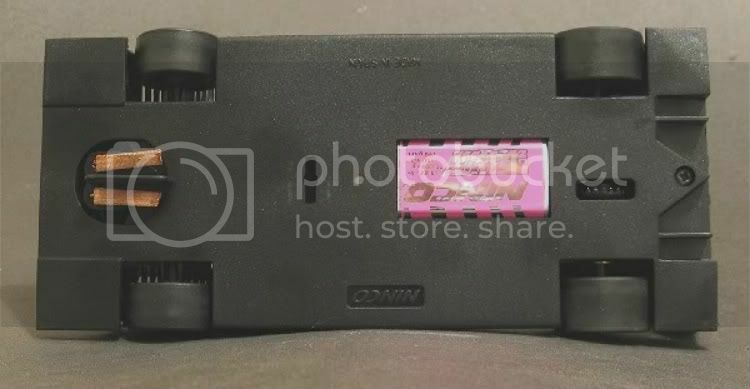 If you race on plastic it will be as well to press the magnet in if there is any doubt. The holder is quite grippy and I suspect placing it on a track will not pull it into position. For board track/non magnet racing you will need to carry out the usual mods. The first being ballasting. Next would be tyre truing and wheel centring. This is a long wide model and the fact that there is a bit of vertical movement in the front axle shouldn’t be too much of a worry. On narrower models it would be crucial if not critical to have the front wheels firmly on the track but with a 64 mm axle width this is going to be academic! The tyres catch my attention too, they don’t feel and look like normal rubber....or silicone, or anything else for that matter? More like (as someone pointed out to me) the rubber found on the handles of screwdrivers, saws, kitchen utensils and a host of other modern applications?? Also, the model has a fixed guide, not the usual sprung guide which has been popular until now. Guide movement sideways is acceptable but front to rear guide movement is a bit excessive. This will allow the guide to tip backward especially at speed, causing the model to tun on the front of the braid. Not an ideal situation, especially on painted tracks. This is given away by tell tale marks on the front of the braids where they have been scuffing. Lastly, only two screws fix the body. I like it! And what’s more, the chassis is ripe for improvement if needed. Being an in line set up it doesn’t have the weaknesses of the side winder at the rear axle. The back of the model is quite firm but if not happy, there is plenty of space to add a brace. Next it is necessary to run the model and what better place than my local 21 metre sweeping two lane board track, so I took it along to one of the Red Teams soirees and between events and during a lunch stop, put it on red lane for a work out. The track had been well used, there was plenty of grip in the strange rubber and the model took off smartly on full throttle. The tyres worked well from the word go and I soon settled into some steady laps. First thoughts were that it was quite noisy?? Not terribly noisy but on a par with my old SCX Audi R8 when it first went on a track. The sort of noise that said there were a lot of rattling parts? But there weren’t? Removing the tyres showed it to be a rattly front axle. Further driving showed the motor to be tight in the chassis too. No hop, no jump and no annoying juddering on acceleration as is usual with new Nincos on board. So that was a plus in itself. But because it can’t be guaranteed to last, the motor will be glued in next time it is taken apart, and the front axle may well get a similar fate. So, SOOB on board the model was streets in front for set up and would only need additional set up for technical tracks that I race on. Just one thing still bemuses me, why do Ninco use a 3 : 1 gear ratio for their inline models and 2.66 : 1 predominantly in their angle winders?? Search me! So what’s It like on plastic. As expected it can return a good turn of speed on home territory and the couple of vices it has are easily fixed. One is its tendency to deslot on the exit of bends, normally associated with sidewinder set ups. This could be a couple of things. Firstly, the model’s guide does tilt front to rear a bit so that may need attention. 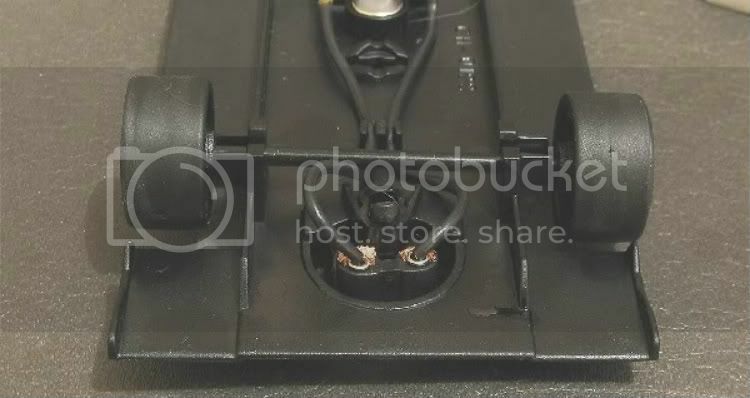 Secondly, when racing with lower ohmage throttles, the power snaps in a bit more and the model momentarily overcomes the traction magnet and this, accompanied by normal plastic track unevenness, causes the model to bounce from the slot especially on slower bends. The cure would be some well placed ballast in front of the front axle, if possible. Other than that on Ninco track it is well behaved and is capable of mixing it with the majority of other LMP’s in its motor class. But as with all Ninco models the button magnet lets it down in the end. Too far forward and letting go in a hard sliding corner. The tyres seem to work well, what ever they’re made of and with a bit of a clean before each race can have ample grip. On Carrera and Scaley Sport I suspect there would be some on going grip problems. But, this model falls into a grey area. Is it too long for technical circuits or circuits with a deal of tight bends?? I think it is! Its predecessor (Ninco BMW LMP) in my racing stable is a great model. It has heaps of speed and in the tight and twistier sections of most of my local tracks it behaves impeccably at a weigh it of 95 grams. The models short coming was on the long straight tracks with high speed sweepers. The Acura is the other side of the coin!! It is going to be hard to catch in its motor class on the fast sweeper circuits but I suspect and am almost convinced it will be too long on the tight and technical tracks. This will be demonstrated by tail antics on the exit of bends. More ballast and careful tyre choice may offset this but by then its older (and more nimble) cousin may well have done the business. I hope I’m wrong! It is an interesting thing that they use a 3:1 ratio in the inline motors yet a 2.66 (or 2.7, depending on how you round it) ratio in the angle winders. WIth the 2.66:1 ratio, it gives you a higher top speed compared to the 3:1 ratio, but gives you slower acceleration (At least, it does that in a car and I'm treating the final drive ratio in a slot car the same I'd treat it in my silvia. The higher the number, the more punch it has, the lower the number, the higher top speed... Eg, I have a 4.3:1 diff in my Silvia, so I have a lot of punch... If I put a 3.9:1 diff in it, I'd get a lot more top end speed). Maybe this decision by Ninco is simply a way to curb the excessive hop generated by the angle winder setups when the motor is not glued in? 3:1 ratio with a 20,000 rpm motor = 6666rpm at the wheels. 2.66 (or 2.7 with excel rounding up) with a 20,000 rpm motor = 7500rpm at the wheels. So, with the same circumference tyres, that should equate to a longer distance being travelled by the 2.66 : 1 ratio car. Shouldn't it? Drive ratios are not my specialty. But if the above is correct... 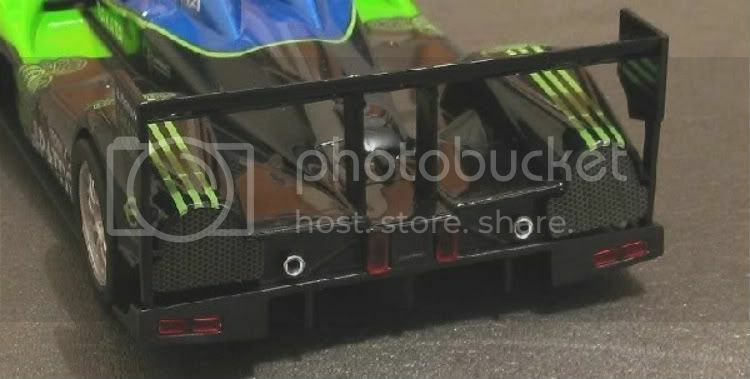 I think it could be Nincos way of eliminated excessive (and considering they are a plastic track car manufacturer) hop. Just a thought about it.